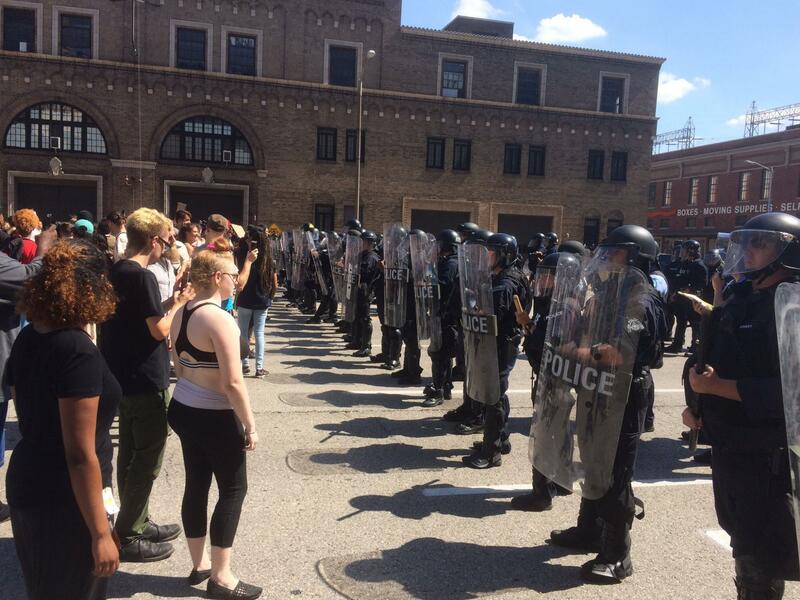 Following protests on Friday and Saturday St Louis residents were back out on the streets Sunday. Six minutes of silence were held outside St Louis County Police Department headquarters on Sunday afternoon, representing the six years since Anthony Lamar Smith was killed by officer Jason Stockley. An unmarked police car reversed through protesters late afternoon. Later in the evening, police were firing rubber bullets and/or pepper balls at protestors in the street. Several police had to be treated for tear gas exposure. The SLPD twitter account attempted to blame this on 'unknown chemicals' used by protesters. A closer inspection of the SLPD's own photo showed those unknown chemicals to be none other than apple cider, a remedy for tear gas exposure. Cops at one point surrounded a group of people milling around, mostly journalists and live streamers, kettled them, pepper sprayed them while on the ground, then mass arrested the group. Amongst 80 arrests last night, STL Post Dispatch reporter Mike Faulk was among those arrested. A few hours after his arrest, the Post Dispatch showed their support... by promoting a police union fundraiser for cops working overtime. In December 2014, thousands of students walked out of schools across the country to protest the grand jury decision not to indict Darren Wilson over the killing of Mike Brown. This morning, students at schools including Kirkwood High School, Webster Groves High School, and University City High School walked out in the early morning. The UCHS high school protest was supported by and organised by school staff, however students took matters into their own hands with a disciplined and determined march away from the school when an administrator announced the protest was over via loudhailer. Unfortunately school administrators managed to corral them back towards the school before they'd managed to get too far away. Run, don't walk, next time kids. Thanks for these excellent updates. Acording to The Guardian cops were also chanting "Whose streets? our streets" to taunt protesters.